USA 1 Cent Shipping 1980's Vintage knitting pattern. Mens and misses random check knitted sweater vests patterns. Original pattern not a copy. Includes only the pattern not the completed item. More vintage knitting patterns listed in these sizes misses, womens plus sizes, girls, boys, mens, toys. Book 1. These vests are a gift for those who enjoy knitting with several colors, and make a nice change from the more traditional Fair Isle and jacquard patterns. 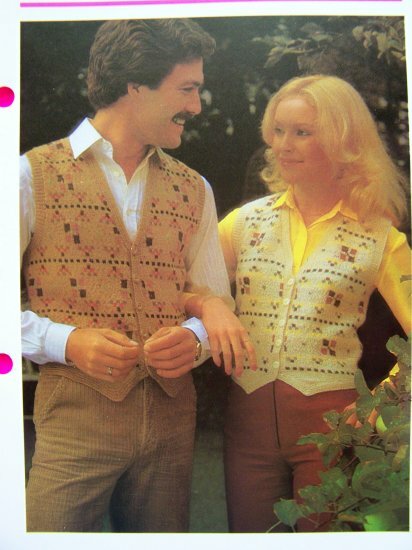 Pattern name: His/Hers random check Sweater vests. Measurements: Body chest or bust: 32 -34 - 36 - 38 - 40 - 42". Length from back of neck: 18 - 18 1/2 - 19 1/2 - 21 - 21 1/2 - 22". Needles: 1 pair each of No 2 and No 3 knitting needles. More vintage knitting patterns listed at both of my stores. S & H to the USA : $1.00 for up to two folded and mailed in a long envelope. Or $2.25 for an unlimited amount of this type of knitting pattern mailed flat. Looking for a certain pattern? I have over 8000 retro vintage sewing, knitting and crocheting patterns in stock and I may just have it! I do combine shipping between both of my stores!